1 – be relatively specific. If you are an architectural designer, keep most of your boards within this sector – maybe contemporary interiors, great cladding, buildings we love etc. Do have some ‘character’ boards, like fashions we love, but not too many. Remember, this is a business account. 2 – title your pins and boards well – provide some information but not too much. Keep within the sort of Twitter post space of 140 characters and you are looking good – but always title your pins. automatically put a banner over the corner of your image with the price, attracting more potential buyers. 4 – link to other Pinners and comment on their images in the same way as you do on other social media platforms. This is social media remember, so be social. 5 – ensure your Pinterest shows up somewhere else – we have ours linked to our studio blog ‘the ecospot’, so if you look to the right of our daily post you will see the last three items we have found, loved and pinned. 6 – pin from different places. It is very boring when people just continually pin images from their own websites again and again. Of course, you want to show people what you do, but ensure there is a good spread of things you do and stuff that influences you as well – both that you have found ‘fresh’ from the web and stuff you have repinned from others. 7 – show your personality. Have one or two boards that show your humour, or a sport you adore (this could be your character boards, as listed in point 1). Show you are a studio of real people, not an automatic Pinterest bot. In our experience, clients not only want great designers, they want people they can relate to and get on with. 8 – make the most of the virtual nature to connect with your clients in the early project stages, using the secret boards option if required. All with no arranging images on sheets in Photoshop, no printing and no travelling – quicker and more efficient. 10 – enjoy it. The sketchbook of any designer – be it paper or virtual is a very precious item indeed and should show the progression of your craft. 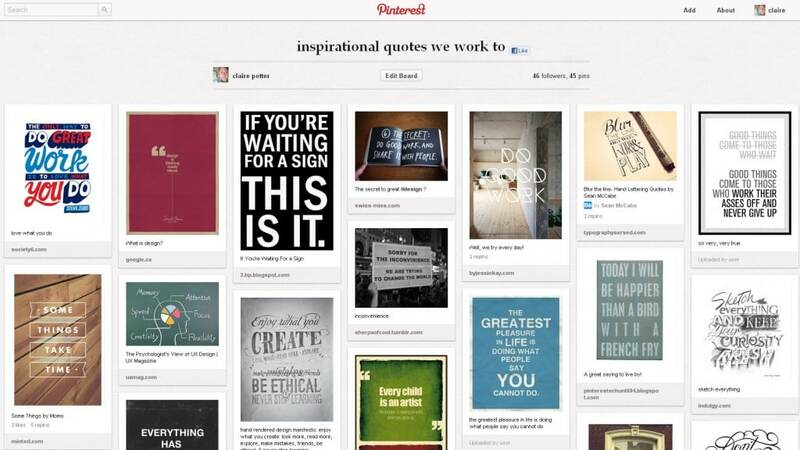 Treat your Pinterest account in this way – collect items for future use and inspiration – never see it as a burden. So there we go – another long post we know, but we have been speaking to so many other designers about Pinterest lately, we needed to put it all on virtual paper – and when you do get there – come and say hello.